Turkey Club Sub Sandwich 12 Turkey Club Sub Sandwich  - - It's Free! 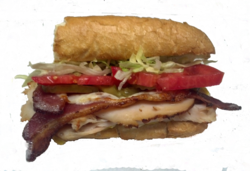 : South Shore Pizza & Subs Apollo Beach Ruskin Sun City Wimauma, South Shore Pizza delivers the freshest, best tasting, pizza and sub sandwiches in South Shore pizza! Turkey Club A sub sandwich with turkey and bacon.Please be sure to customize this sub with your favorite ingredients. The only thing it comes with automatically are the meats. Please choose your ingredients below.